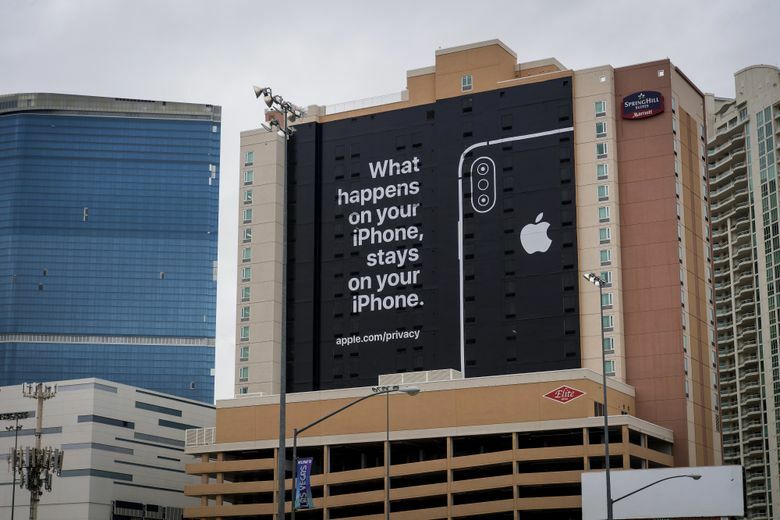 A billboard advertising Apple Inc. iPhone security is displayed in Las Vegas, Nevada, on Jan. 7, 2019. (Bloomberg photo by David Paul Morris). “What happens on your iPhone stays on your iPhone,” the billboard says, in a play on the Las Vegas slogan. Apple’s presence is hanging over CES 2019, the annual consumer technology confab – even though the tech giant isn’t attending. In a not-so-subtle shot at Google, Apple touted its commitment to privacy on a giant billboard in Las Vegas as tech companies and tech enthusiasts gathered there. “What happens on your iPhone stays on your iPhone,” the massive letters read, spanning the height of an entire building. The ad plays off the Sin City slogan “What happens in Vegas stays in Vegas” and works as an apparent jab against Apple’s Silicon Valley competitor. Google, which makes the world’s most widely deployed mobile operating system, Android, has a large footprint at the show. Another of Apple’s main rivals, Samsung, kicked off its presence at CES by announcing a deal with Apple to offer Apple’s iTunes and Airplay 2 streaming support on Samsung’s 2019 smart televisions, in a first-time partnership. This spring, Samsung owners will get access to an iTunes app on their TV sets, and will be able to stream music, movies and shows from their iPhone or other Apple devices onto their TV. The partnership is significant because it represents yet another step of Apple lowering its walls to rivals to advance its entertainment services – critical revenue as growth in its hardware sales slumps. Samsung is the world’s top global supplier of smartphones, whose devices compete with the iPhone, but its televisions offer a way for Apple to get its content onto bigger screens in the home. Apple is known for its tight control over every aspect of its ecosystem, from consumer privacy to its proprietary messaging and entertainment software, which helps lock in customers and drive sales to its hardware. As controversies tied to data collection practices have arisen in recent years, the iPhone maker has tried to differentiate itself from its tech industry peers, including Google and Facebook. The billboard advances Apple’s self-perception as a hardware manufacturer, in contrast to Silicon Valley’s dominant data-hungry Web companies. However, Google is also one of Apple’s main partners, and the search giant pays billions of dollars to be the default search engine on iPhones. Both Apple and Google declined comment. Google has faced a number of questions about privacy and security, including a software bug in Google+ in November that could have allowed access to 52 million users’ personal information without their permission. And during a recent hearing on Capitol Hill, lawmakers questioned Google chief executive Sundar Pichai about the scope of data collection on the Android operating system. In October, Apple chief executive Tim Cook delivered a biting critique of Silicon Valley to the European Parliament in Brussels, warning powerful regulators of an emerging “data-industrial complex” and of anti-democratic forces brewing on social media. Cook did not mention Facebook, Google or any other tech company by name, but he emphasized that privacy is a “fundamental human right.” During the same speech, Cook called on U.S. officials to pass a comprehensive digital privacy law and praised the European Union’s aggressive data protection rules that recently took effect. “Now, more than ever – as leaders of governments, as decision-makers in business, and as citizens – we must ask ourselves a fundamental question: What kind of world do we want to live in?” he said. Apple isn’t known for playing nice with others. But as The Washington Post’s Geoffrey Fowler wrote last month, in his 2019 predictions for tech, as Apple develops its business lines beyond selling hardware, it’s going to need some frenemies. Integration between Apple devices and Samsung’s smart TV’s may give the company the reach and exposure that its Apple TV streaming boxes couldn’t get on their own. “We look forward to bringing the iTunes and AirPlay 2 experience to even more customers around the world through Samsung Smart TVs, so iPhone, iPad and Mac users have yet another way to enjoy all their favorite content on the biggest screen in their home,” Eddy Cue, Apple’s senior vice president of Internet software and services, said in a statement Sunday. While Apple is opening up in new ways to boost its services offerings, it also remains protective of revenue it generates through its app store. Apple is meeting some resistance from software developers who wish to sell their apps directly to consumers, bypassing Apple and Google’s online storefronts, and cutting the tech giants out of hundreds of millions of dollars in app-purchasing fees. Netflix, for instance, no longer allows new customers to pay their monthly subscription fees through iTunes; subscribers are directed to settle their bills on Netflix’s own website. Not all of Apple’s recent attention-grabbing has been intentional, however. Last week, Cook delivered an ominous warning to investors as the company lowered its earnings projections for the current quarter, citing a weakened economy in China and lower than expected iPhone revenue. But some tech analysts say Apple’s woes extend beyond short-term shifts in foreign markets and point to fundamental changes in consumer behavior and a lack of innovative risk-taking.